Try FREE Expression Web Menu Tool! Help your website visitor find the information around the site with ease with vista image buttons. Create a superb and stylish web menu or separate buttons in you favorite web design tool with expression web menu add-in. It is absolutely free. You should follow only a few simple steps and your dropdown menu will be ready. Open your website in expression web, find the place where you want to have a menu or buttons and press vista buttons icon on the toolbar. The vista buttons application opens where you can create your expression web dropdown menu. Add the number of buttons and subitems you desire, specify text, link target and other available parameters. 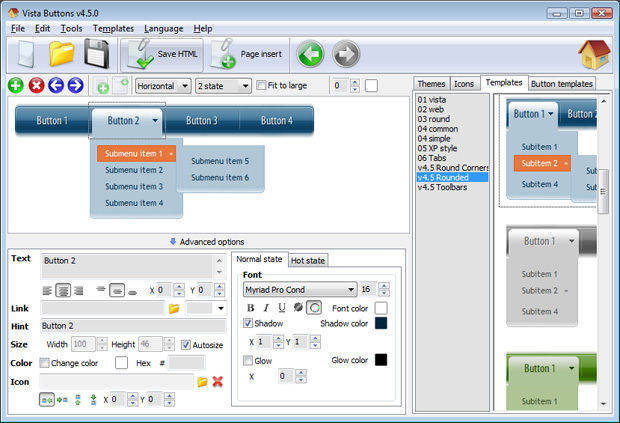 Expression Web Menu is an utility that works under windows xp, windows vista and windows 7. It supports both 32-bit & 64-bit windows editions, therefore it could run faster on 64-bit computers. It is Free so you can download it and share it with your friends. Estimated download time for Expression Web Menu on a common adsl connection is less than a minute. Version 1.0 was released three thousand two hundred twenty two days ago by Apycom Software. Click the green download button to download it now.